Replastering a wall or ceiling is the most effective way to change the appearance and ensure a smooth, attractive finish. Once dry, plaster can be painted, wallpapered or tiled over easily. With a specialist plasterer, all the cracks, dents and bumps will be removed. This is especially good for when you wallpaper or tile the new surface as it’ll create a much cleaner finish for your walls. By plastering your walls and ceilings you’ll have a surface which can then be decorated quickly and easily. And plastering doesn’t cost a bomb either, proving to be a cost effective way of redecorating. One of the major benefits of plastering is that it can be applied to any wall or ceiling, no matter the size and shape. It’s a quick solution to dealing with old, cracked and dented surfaces, leaving a clean, smooth outcome. By plaster covering your walls you’ll make future decorating much simpler, with paint, wallpaper and tiles all possible. As there are no bumps or dents, wallpaper in particular will benefit and will look much better on the wall. And replastering your walls and ceilings won’t break the bank either. It’s a cost effective way to change the look of a room in your home and have a surface that can be decorated straight onto. 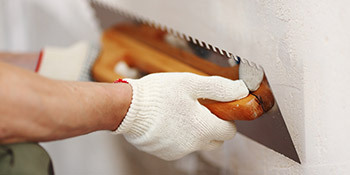 Professional plasterers will be able to replaster just one room or even a whole house in just a matter of days. This will ensure a fantastic finished surface that can be decorated without any hassle. For up to four FREE quotes for replastering work in your home, just complete our quick form and hear from vetted, local and reputable professionals. Project: New timber frame self-build 4-bed house with a single garage/annexe. Tape, Joint and plastering/skim required. Should be ready for plastering work mid-June. Project: Fully fire-board basement ceiling. Needs to be 30 minute fire proof. Project: Repair pebble dashed exterior wall .Damaged area measures 1mX 1m. Project: Artex is to be removed from the whole house which is 597 sq ft.
Project: 3 bedrooms; 2.7x2.8, 3.1x3.8 and 2x5x3.7 walls and ceilings to be plastered (skimmed). Excellent, conscientious worker and pleasant manner. I would recommend or use again in future. Excellent and professional. Came and surveyed the whole property and even told us when we didnt actually need certain aspects of the work done and offered us a better alternative. All in all, extremely professional, competitive and honest worker. They are currently doing up the property and it looks fantastic so far and they're working at a great pace. I am extremely satisfied with their work so far and can't wait to see what it looks like once it's done. Excellent tradesman, top quality plastering and decorating as well as very friendly and helpful. Competitively priced. Highly recommended. very messy, did not clean up after work. Left used and wet plaster in the house in a bin bag. Door strip removed was not put back despite promising to do same. Could have done better. Tradesman contacted me very quickly with a quote. It's helpful to find people to do what is needed that are based near you. However? Once you have been in contact with one and they're on the job it would be good for a general message to be sent so that you're not receiving calls for the job. Homes are given an energy rating based on just how efficient they are and ratings are presented in the information below. This varies from A, by far the most energy efficient, to G, the least efficient. With a higher rating you're more likely to have less expensive energy bills as more heat is going to be retained in the house. You are able to improve your home's efficiency with insulation including double glazing, loft lagging or wall cavity insulation. The information below illustrates the diverse types of homes within Uk. By far the most commonplace homes around the United Kingdom are detached and semi-detached households. Other kinds of homes include terraced houses, flats, converted flats and bungalows. The data below provides an indication to the number of properties in Uk that are central heated and non-central heated. Households are heated by a variety of sources which reflect how expensive annual energy bills will likely be. Types of central heating include gas, electricity, oil, solid fuel and LPG boilers. Changing the way your house is heated could see you with cheaper bills. The data beneath illustrates the spread of houses heated up by different fuels. Around the United Kingdom the most common hands down are gas heated properties, followed by electricity and then oil. Biomass boilers are also increasing in popularity, heated by green products such as wooden pellets or agricultural waste.|Properties in the UK are heated by a number of fuels, such as gas, electricity, oil, solid fuel and LPG boilers. Each fuel has a varying cost associated with it so you might find yourself with less costly energy bills by altering how your property is heated. Even solar thermal panels are being regarded as by many as a way to reduce heating bills for the many years to come.